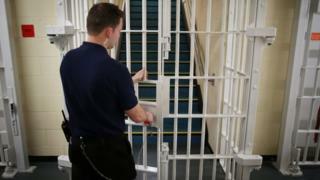 Only 5% of existing prison staff in England and Wales will receive new pay allowances of up to £5,000, BBC News has discovered. Internal documents also reveal that many of the officers who will receive the increase were already receiving allowances of £4,000. The details were not included when the pay rise was announced by Justice Secretary Liz Truss. Officials deny they have given out any inaccurate or misleading information. When the announcement of the new allowances was made, the Ministry of Justice said it would apply to "Band 3" front-line prison officers in 31 jails where it had been hard to recruit and retain staff. The jails are in London and south-east England, and include Bedford, Belmarsh, Brixton, Chelmsford, Feltham, Pentonville, Wandsworth, Whitemoor and Wormwood Scrubs. The Prison Officers Association said at the time that although it welcomed any additional pay for its members, it was a "divisive" decision because it "ignored" many other grades of staff. The department said "thousands" would get an "immediate" pay boost. But an internal briefing note seen by the BBC reveals that the number benefiting immediately is 1,617 prison officers out of more than 30,742 staff working in public-sector prisons - 5.26% of the workforce. The document also reveals that the new allowances, worth £3,000 in some jails and £5,000 in others, replace existing payments of £2,500 and £4,000. When the rises were announced, the Ministry of Justice did not disclose how much the current payments were worth, saying only that the new allowances replaced "existing pay increments". Its decision to leave out important details may have led to the impression that the pay increase was more widespread and substantial than it really was. In March, Ms Truss's department was heavily criticised by Lord Thomas of Cwmgiedd, the Lord Chief Justice of England and Wales, for its handling of an announcement to extend a programme to allow vulnerable witnesses to be cross-examined before a trial. Lord Thomas said there had been a "complete failure" by the ministry to understand the practical difficulties of extending the scheme, saying judges had to correct a "serious misapprehension" about the roll-out. The Ministry of Justice has not issued an official statement in response to the latest disclosures, but officials said its February press release did not contain anything that was factually incorrect or misleading, and pointed out that staff joining the 31 prisons would also be entitled to the payments. The document said about 2,400 new prison officers, who are expected to join the selected jails during 2017-18, would be eligible to receive the allowances which will be available annually at least until March 2021. As part of other changes, Band 3 prison officers at the jails will be paid from the "midpoint" of their pay range. It means they can expect to earn between £26,456 to £31,453, including the allowances, as a "minimum".